Disclosure: This is a sponsored post with Tatu Digital Media. All opinions are my own. Looking for the perfect gift is a difficult and as kids get older it’s even more difficult to cater to their changing wish list. I have found that iTunes gift cards are the perfect solution! I use to think gift cards were impersonal and not thoughtful, but I’ve come to realize the exact opposite. Gift cards allow people to get exactly what they want and the iTunes gift card says you put thought and care into the gift. Almost everyone I know uses iTunes whether they are toddlers playing games, teenagers listening to music or adults downloading apps. Appealing to such a broad age group makes the iTunes gift card a perfect gift for any occasion. Whether it’s for a kid going back to school, a birthday gift or even Christmas, the iTunes gift card is a hit because they are sure to love it and use it. Right now is a great time to buy gift cards and even hold on to them for those perfect moments. 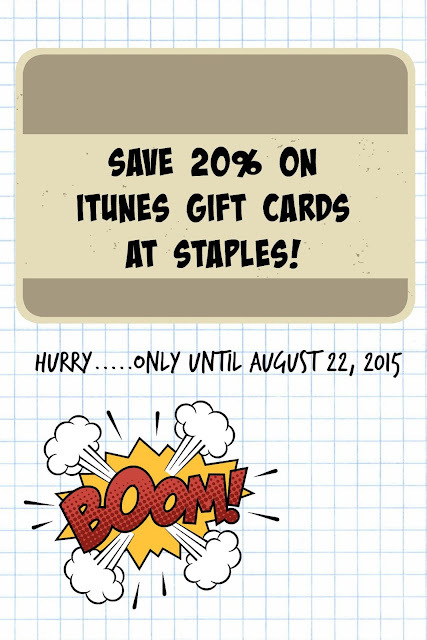 Staples has paired with iTunes to offer 20% off when you buy $25 or more in iTunes gift cards either in store or online. You can mix and match any iTunes cards to total $25 or more. It’s a perfect way to stock up on the perfect gifts for anyone in your life including yourself. Additionally, if you have a Chase Ink Business credit card, you can double dip in savings. Chase offers increased rewards on purchases made at office supply stores so you can earn an additional 4x points or 5% cash back on your iTunes purchase from Staples. You can use iTunes gift cards at the iTunes Store, App Store, iBooks Store or Mac App Store, which means that almost everyone you could think of can find a use for this gift card. I found these perfect for my husband and our siblings who love their Apple TV and use an app for almost everything in their life. Additionally, I thought this was a perfect buy for my husband’s staff and my son’s teachers for the holiday season so I’ve stocked up in anticipation. This offer is limited and only lasts until August 22nd so you have to act fast. Don’t miss out on a great deal and a great gift that you’ll surely use and your friends and family will surely love.